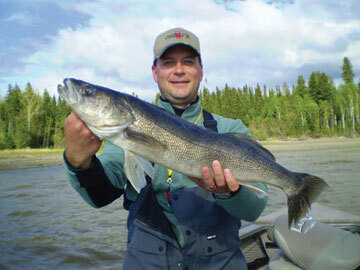 The shear size of Lac Seul has led my guide staff to think about walleye structure on a different scale. The prevailing winds and currents of a small lake may result in a “drift” of sand on the lee side of an island that is maybe a 100 yds long and 25 yds wide. Most every walleye angler would recognize this as a sand bar and a potential walleye spot. Increase the scale by 10 times or more and try to envision a version of a bar that is over a mile long, perhaps 200 yds. wide, that tops out at 15 feet, and drops off on all sides into 70ft. Is this a bar? Is it a Flat? We call them “Mega-Sand” structures and especially in July and August, big walleyes call them home. If I had come across such a structure 5 years ago, I probably would have scanned it quickly with my graph, searched for a weed bed on top, possibly fished the end of the point with a jig, and then dismissed it as walleye wasteland. During the Summer months on Lac Seul, I now spend at least 50% of my time plying this type of water, especially for big walleyes. Brett McCallum is one of my Senior crew and is the most proficient “Mega-Structure” guide on staff. During the months of July and Aug., he averages one 28 in. walleye every day, and was close to one 29 in. fish every other day this past season. A great deal of his success can be attributed to his natural ability to watch his graph and develop a 3 dimensional image in his mind of the piece of structure he is fishing. What would appear to most anglers as a large featureless flat in the middle of the lake, becomes to him a blown up version of a sand bar. His approach to fishing it is similar to what most anglers would do with smaller structure. He breaks it down into pieces. He looks for the edges, the top, and the breaks and then he covers water quickly with bottom bouncers and spinners usually with crawlers, but sometimes with minnows. The key is to find the preferred depth range for that days weather conditions. With wind and clouds, the search begins shallower or on top of the structure on the windward side looking for active fish. After a front or with less wind, the search goes deeper. Backtrolling at all times to cover water with an eye on the graph, the guides watch for balls of bait fish as well as marked walleyes. Subtle inside corners, changes in grade and termination points can all concentrate fish, especially in the presence of wind and favorable surface currents. On occasion, Brett will work off the structure and look for fish suspended over the main lake basin. The approach requires discipline and faith, but gets much easier when you “know” your water and after you’ve landed several giants.